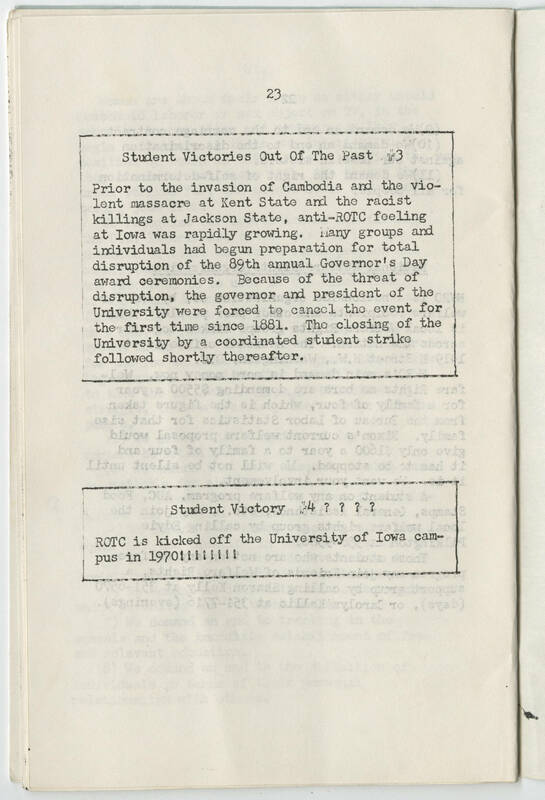 23 Student Victories Out Of The Past 3 Prior to the invasion of Cambodia and the violent massacre at Kent State and the racist killings at Jackson State, anti-ROTC feeling at Iowa was rapidly growing. Many groups and individuals had begun preparation for total disruption of the 98th annual Governor's Day award ceremonies. Because of the threat of disruption, the governor and president of the University were forced to cancel the event for the first time since 1881. The closing of the University by a coordinated student strike followed shortly thereafter. Student Victory 4 ? ? ? ? ROTC is kicked off the University of Iowa campus in 1970!!!!!! !